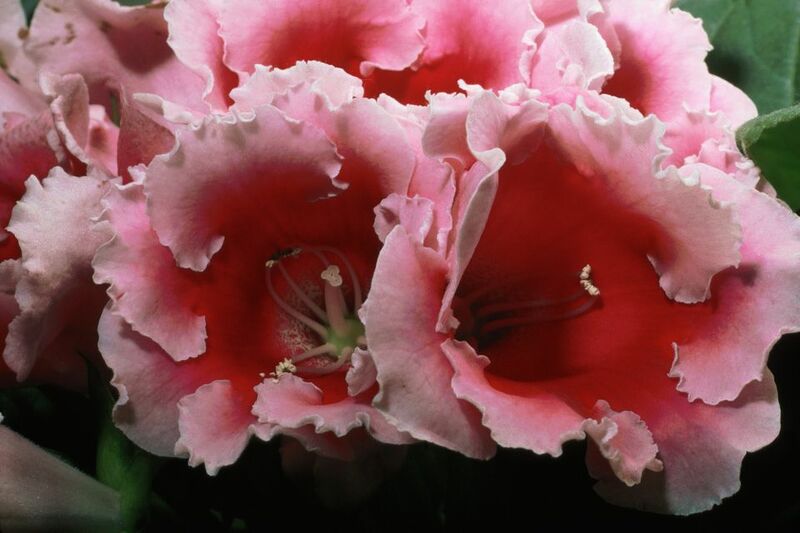 The various gloxinia hybrids are a "bang for your buck" kind of plant. These plants feature large, velvety leaves somewhat reminiscent of African violets with giant, bell-shaped flowers in a range of bright colors. They are available as double and single flowers and create great centerpieces for tables or sill plants for that somewhat shady sill. Gloxinia is not especially hard to grow—perhaps this is my invention, but I like to think that if you can grow African violets, you can grow wonderful gloxinia. Although they are tuberous plants that will regrow from the underground tuber after blooming, it's probably best to discard bloomed plants as they will never regain their original vigor. Among gloxinia enthusiasts, it's often a goal to collect as many colors as flower shapes as possible. Light: Bright, indirect light. Gloxinia does not like direct sunlight and should not be exposed to it. Water: Keep soil constantly moist throughout the growing and blooming season. Provide humidity, but do not directly spray leaves. Misting encourages fungal diseases. If you're going to repot after the bloom is done, cut water back and let the leaves die, then repot into a fresh pot and begin watering again after it's sprouted. Temperature: Average (70˚F-78˚F). They do not like dry heat. Soil: A loose, well-drained, slightly acidic potting mix, like a gardenia or African violet mix. Fertilizer: Fertilize during the growing season with liquid fertilizer or controlled-release fertilizer according to label instructions. Reduce fertilizer during dormancy. Gloxinia is relatively easy to propagate. You can take leaf cuttings when the plant is actively growing and sprout them in damp sand or seed-starting soil. Alternatively, you can divide the tubers during repotting and repot tuber pieces into individual pots. That said, however, most modern gloxinias are bred to produce very large flowers and will never regain their original glory after reblooming. When it comes to repotting, gloxinia should not be messed with during the growth season. Repotting should only be performed in the late winter when the last year's growing season is done, and the leaves have died back. When you repot, put the tuber into a slightly larger pot with fresh, slightly acidic soil (as for gardenias, for example) and resume watering. New leaves should sprout from the tuber, and the plant will continue growing until it flowers again. Flowering can happen at any time of the year. The vast majority of gloxinia on the market today are hybrids of the Sinningia speciosa. However, by crossing S. speciosa with other plants from the Sinningia genus, such as S. regina, breeders have been able to create a wonderful kaleidoscope of colors and flower forms, including striped and double flowers. Do not think the plant is dead after it stops flowering. It may just be going through the normal growth cycle of a tuberous plant, which typically experiences a flush of leaf growth from a dry tuber, then flowers, and then dies back. Today, you can grow gloxinia from their tubers, but because the plants will never regain their former glory, it's probably a good idea to think of them as annuals and discard plants after the bloom is done. In terms of growing environments, gloxinia does well in bright, humid, and moist environments, but they are very sensitive to lack of air flow and water on their leaves. Both will encourage rot. Also, they should not be left sitting in water for any longer than necessary as this will encourage tuber rot. On the other hand, plants that are too dry begin to experience rolled-up leaves. Gloxinia is susceptible to aphids, mealy bugs, whiteflies, and scale. Remove infected plants from proximity to other houseplants and discard them. The use of sprays and insecticides will usually ruin the delicate blooms.